You haven’t truly lived at college until someone burns popcorn in the communal microwave at 11:30 p.m. at night…most likely on a night before a big exam. 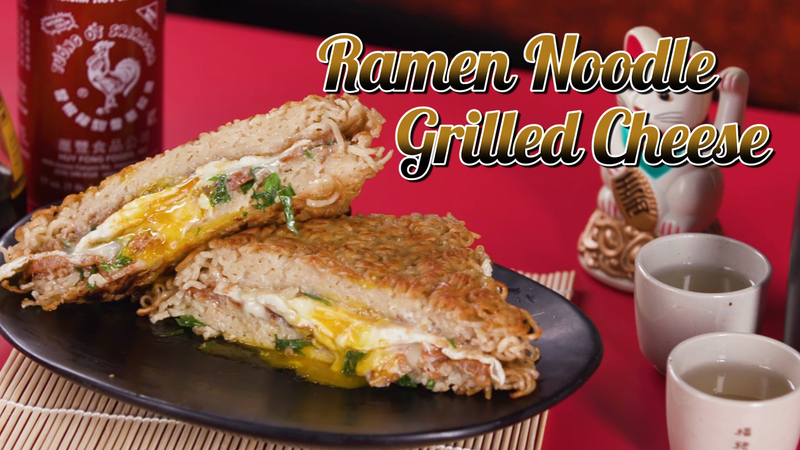 This ramen noodle grilled cheese will time travel you right back to those good ol’ days of having to fend for yourself in “the real world.” Whether you’re in college now or years past it, this is indulgent comfort food and its deliciousness will be hard to pass up. The good news is that this recipe is actually way more delicious than anything you could probably make in a dorm room. The cooked ramen noodles as the “bread” of this sandwich actually holds together, and there’s a delicious crunch and flavoring in every bite. With ooey gooey cheese, a runny egg, and crisp bacon, this could be easily breakfast, lunch, and dinner any day of the week. Customize with your favorite ramen flavors and remember to share with your friends. Follow the instructions below to make your own. 1. Cook ramen in boiling salted water for 3 minutes. Drain noodles but DO NOT rinse. Let cool, about 10 minutes. 2. Line a 9- x 5-inch loaf pan with plastic wrap or parchment paper with a couple inches of overhang on each side. Spray with cooking spray. 3. Beat 1 of the eggs; add to cooked ramen, and toss well to coat. Add ramen mixture to prepared loaf pan; spread evenly into pan. Fold overhanging plastic over top of ramen mixture; press firmly into pan. Chill 10 minutes or up to 2 hours. 4. Heat 1 tablespoon of the butter in a nonstick skillet over medium-high. Fry remaining egg; transfer to a plate. Carefully remove ramen mixture from loaf pan, and place in hot skillet. Allow ramen to brown slightly, about 5 minutes, then carefully cut in half to make 2 equal squares. Add remaining 1 tablespoon butter, and flip each square to brown other side. 5. While ramen squares cook, add 2 cheese slices and scallions to each square. Place bacon on 1 square, and fried egg on the other. Cook until cheese begins to melt and ramen is golden brown, about 5 minutes. 6. Carefully place 2 topped squares together to form a sandwich (ramen will be the “bread”). Press down with spatula; cook 2 to 3 more minutes. Cut in half; enjoy immediately! Serve with soy sauce and Sriracha.